Years ago, when I got my first 35mm, I would sit outside at night during a thunderstorm shooting lighting. I'd set my camera on bulb mode, and wait till a few bolts went off. After I moved to Portland, I was slightly disappointed that lightning and thunder weren't all that common. Now that I'm back in Montana, I get to shoot lightning again. 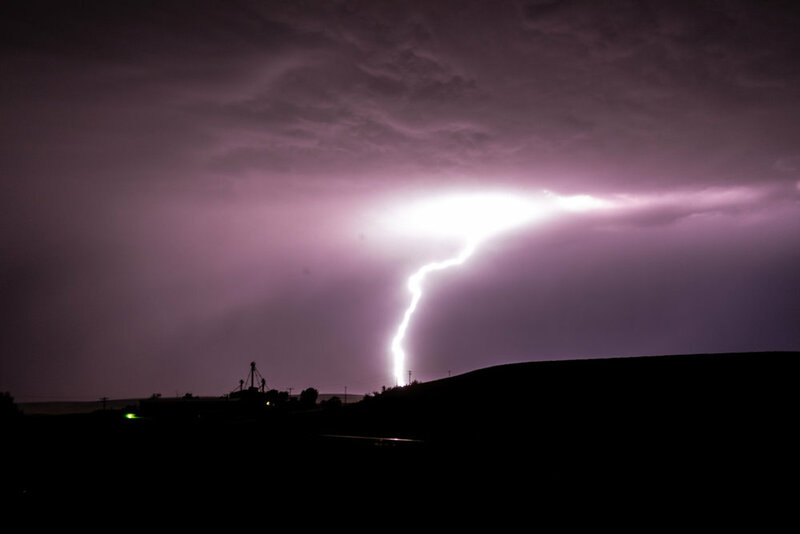 The other night, an awesome storm rumbled by, and I went out to see what I could get. There was so much lightning, instead of using bulb mode, I just hit the shutter button when I saw a flash. The clouds were diffusing most of the show, but I managed to get one shot. Unfortunately, I was still working out the right exposure settings, so it was blown out SOOC. I pulled down the exposure in Lightroom, and the photo above was the end result. I would have preferred to expose it correctly in camera, but mother nature doesn't wait around for anyone. There's another lesson in there. Never delete photos in-camera. Sometimes you can fix it. Not always, but sometimes.